“When it comes to selecting the right faucets for your space, personal design preferences are a key piece of the puzzle,” said Maribeth Kwasniewski, director of retail marketing, Moen. North Olmsted, Ohio… From classic to contemporary, Moen makes it simple to showcase your personal style at the sink. 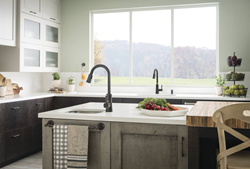 Introducing three new kitchen faucet collections exclusively at Lowe’s – Bridgestone™, Edison™ and Kendall™ – as well as enhancing the existing Kinzel™ line, Moen continues to offer fixtures with the ideal combination of on-trend styling and intuitive, easy-to-use features. Sleek square shapes give the new Bridgestone pulldown kitchen faucet a distinctive profile that complements trendy décor. The two-function pulldown spray wand allows users to switch the water flow from aerated stream to spray with the push of a button. Bridgestone is available with or without a deck plate to accommodate a variety of existing sink configurations. The new Edison kitchen faucet combines structured details with a curved, high-arc spout for an elegant, traditional look. A handle separate from the spout keeps the faucet’s profile clean. The faucet also offers a coordinating soap dispenser as well as a side spray to make washing dishes quick and easy. 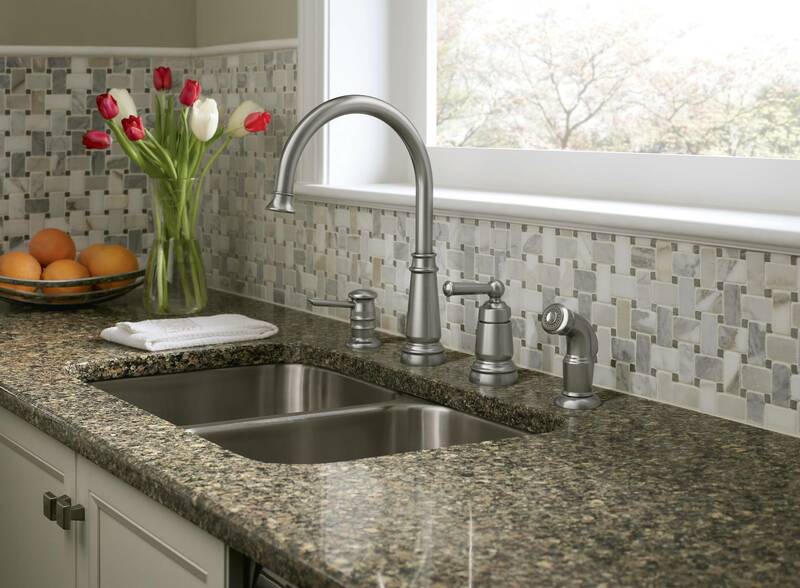 The new Kendall pulldown kitchen faucet offers a clean, contemporary style that is also soft and sleek. An angled side handle combines with smooth, flowing lines, providing a design style that truly makes a statement. Kendall can be installed as a single-hole mount or with an optional deck plate for two, three or four-hole installations. The faucet is equipped with a coordinating soap dispenser. 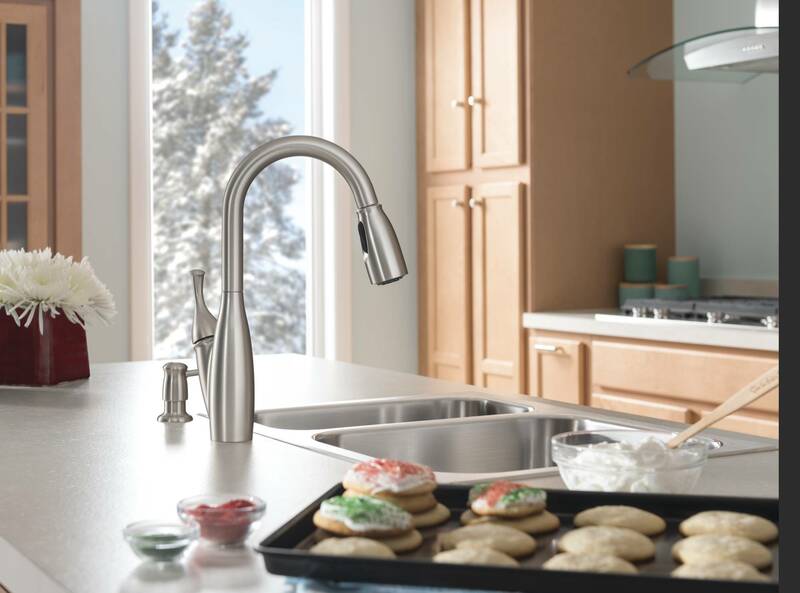 Continuing to enhance the Moen offerings at Lowe’s, the Kinzel pullout kitchen faucet is now available in a Chrome finish in addition to Spot Resist Stainless. Featuring simple, refined lines, Kinzel also offers a lower profile spout that is just the right height – fitting easily into a variety of kitchen countertops and window sill spaces, and helping consumers to fill large pots, reduce splashing and improve rinsing in and around the sink. It features a two-function pullout wand and also includes a coordinating soap dispenser. It can be featured as a single-hole installation, or with a deck plate if a three-hole sink application is desired. Edison, Kendall and Kinzel are available in Moen’s exclusive Spot Resist™ finish, which resists fingerprints and water spots to maintain the brilliance of the fixture. Bridgestone, Kendall and Kinzel include Moen’s innovative Reflex® system. Pullout and pulldown kitchen faucets with the Reflex system offer a self-retracting spray wand designed to put itself away, while also providing smooth operation, easy maneuverability and secure docking. Featured on all four faucets, the intuitive Duralock® Quick-Connect System uses a proprietary, push-button connector that makes installing faucets quick, secure and hassle-free – no tools required. A telltale “click” audibly signals a secure connection. Each of the new products feature Moen’s limited lifetime warranty** to ensure superior quality. For more information about the Bridgestone, Edison, Kendall or Kinzel kitchen faucets, visit moen.com or call 1-800-BUY-MOEN (1-800-289-6636). Moen is part of Fortune Brands Home & Security, Inc. (NYSE: FBHS), which creates products and services that help fulfill the dreams of homeowners and help people feel more secure. The Company's trusted brands include Moen® faucets, Master Lock® and Sentry® Safe security products, MasterBrand® cabinets and Therma-Tru® entry door systems. Fortune Brands holds market leadership positions in all of its segments. Fortune Brands is part of the S&P MidCap 400 Index. For more information, please visit http://www.FBHS.com.